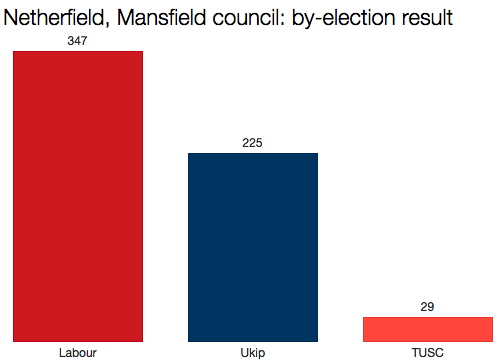 Just one seat changed hands in this week’s council by-elections. This was the first time Ukip had fielded a candidate for this seat. Curiously, neither the Conservatives nor Liberal Democrats bothered. Of the two other by-elections on Thursday, the more significant was a contest for a seat on Thurrock council. This was held by Ukip, despite a 2.4% swing to the Conservatives. The winning candidate was Tim Aker, a Ukip MEP for Eastern England and also the party’s prospective parliamentary candidate for the Thurrock constituency. Thurrock is one of Ukip’s top targets in the general election, one of the Conservatives’ most marginal seats in the country, but would fall to Labour on a swing of just 0.1%. It will almost certainly play host to one of the fiercest battles of the election campaign. Finally, Labour defended a seat on Rossendale council in Lancashire. The contest was held to replace Liz McInnes, who was elected MP for Heywood & Middleton in October. Labour came a comfortable first, followed by the Tories in second place and Ukip third. Ukip’s relatively poor showing here is notable, given how close the party came to defeating McInnes in the by-election. Unlike the Spectator, I would not sum up Ukip’s performance this week as representing a “juggernaut”.